I’m just going to come out and say this. I have very (okay VERY) mixed feelings about back to school nights. I love seeing what my girl does every day — what her world looks like and feels like, to sit at her desks and listen to her teachers and imagine her life from the inside out. I hate seeing what my girl has to do every day — what her world looks like and feels like and how much there is to manage and compartmentalize and plow through and just $%&!ing survive every day. This isn’t our kids’ neighborhood school. It’s not the one into which Brooke’s elementary school feeds. It’s not the one that her sister went to. It’s not the one that all the kids whom she grew up with are currently at. It’s the one that had the program she needed. “I’m sure it’s weirder for Brooke not to recognize 90% of the kids here,” I say. I know I’m supposed to feel better. I don’t. We’re in the gym waiting for the principal to kick off the evening. I’m standing with Liz, the mom of one of Brooke’s friends, a young man with Down’s Syndrome whom she’s known since preschool. These are the parents we know. These are our people. I notice that she’s got a schedule in her hand. Her son has written out the classes she’s to attend for the night. I nudge Luau, motioning to her paper. “Do we have a schedule?” I ask. He shakes his head. I text Katie at home and ask her to look in Brooke’s binder for anything looking like a schedule. She comes up dry. “Do you not have one?” she asks. “I can’t executive function my way out of a paper bag,” I say in response. I laugh just a little too hard. I tell her it’s a brilliant idea. The principal tells us to be sure to look for our kid’s photos in the lobby. Not all of them are up yet, he says, but they should be there. There are walls full of photos, divided by team. No Brooke. Not a big deal. But last year, hers was one of a handful of photos that had a different background from the hundreds of others that all looked exactly the same. It screamed of afterthought, Not a big deal. It’s not a big deal. I remind myself to tell her teacher. When you’re in a substantially separate program inside of a mainstream school, having your picture on the wall with all the other kids is a big deal. We leave the homeroom before anyone else, headed to Brooke’s first class of the model day. We get lost and arrive last. We laugh at our own ineptitude. We listen to the science teacher’s spiel. He sounds excited about what he’s doing, by his involvement with the program, by what the kids have already shown that they can do. I love him. I even love that he’s wearing a tie with the solar system on it. I wish I could get as excited about science as he is. I wonder what Brooke thinks of all of this. There is a ceiling fan clanking behind me and over my head. There is no discernible pattern to the sound as it catches, then whirs, catches, clunks, then whirs. He starts talking about lab work and hands-on discovery and their plan to make Oobleck next week, He tells us about how the kids will run through a tub of the concoction. Luau and I smile at each other. That’s our kid’s wheelhouse. He opens the floor to questions. I ask about the curriculum and standardized tests and the sort of thing that grown-ups are supposed to ask their child’s science teacher. And then I ask another question. Every parent in the room laughs. Luau laughs. Ms K, the teacher in Brooke’s program who co-teaches this class, jumps in too. “Oh gosh, yeah,” she says. She’s not laughing either. We walk across the hall to American History. The teacher asks us to introduce ourselves, sharing our name, our child’s name, and something that we like about our kid. I am overwhelmed with gratitude as I say that my name is Jess, I’m Brooke’s mom, and I love her sense of humor and her energy. I can’t think of a better way to start. She shows us how she clangs two tiny cymbals before class to signal to the kids that it’s time to get ready to learn. “Time for our bodies and hands to be still,” she says. Quiet hands, I want to scream. “My hands are an automatic feedback loop, touching and feeling simultaneously. I think I understand the whole world when I rub my fingertips together,” Julia said. Please, please, please, I want to say. No. I sit quietly, with my body and hands still. Because the teacher told me to. My girl’s life, from the inside out. We walk back down to Brooke’s home base. The difference is palpable. The room feels like home. The teacher points to the numbers on each desk. “I spin a digital spinner every five minutes,” she says. “Then the kids move to a different spot.” Each chair is different. Some traditional, some exercise balls in cradles, some stools, even a recliner. “We never sit for more than five minutes without a movement break,” she says. She talks about strategies. About how they work together to solve problems. How they support the kids through the process of managing their own needs while respecting the teacher’s agenda. How they build in the accommodations necessary to learn. She talks about how, especially early in the year, reading groups are divided not by skill but by interest. How they have a minimum of three different versions of the same books, all at different levels, all appearing the same. “So that we can work on the same material at an appropriate level and pace for each student,” she says. I reach for Luau’s hand and squeeze it just a little too hard. The decision to bring Brooke here was not an easy one. Sitting in this room, watching, listening, FEELING the safety inherent in this space, I’d make it a thousand times over. She’s in the right place. We head off to music where the teacher immediately tells us that he gets a joke at least once a day from our girl. I ask if they’re different every day or if she tells him the same one. “They’re usually about cows,” he says. “What do cows work for?” he asks. Simultaneously, we say, “Moooooolah.” I can’t stop smiling. Later, the math teacher will tell us how excited he is to have the opportunity to work with our kids. It will be obvious that he means it. He will tell us about the curriculum they plan to teach. I will try to believe. I love seeing what she does every day — what her world looks like and feels like, to sit at her desks and listen to her teachers and imagine her life from the inside out. I hate seeing what she has to do every day — what her world looks like and feels like and how much there is to manage and compartmentalize and plow through and just $%&!ing survive every day. She’s in the right place. Jess, why is it that with all the positive you’ve listed here, all i can see is the one teacher with the cymbals? That.breaks.my.heart. Two years ago, i wouldn’t have known better, but when i found your blog, i read the whole thing. Every post. Now, i think i have a sliver of understanding.Can Brooke have a different history class? i pray that she can. Grateful for all you’ve taught me; i KNOW i have more patience when students don’t act *normal* (whatever that is) even here at the University level. We have always made every effort to meet students where they are, and that effort has increased tremendously based on what i’ve learned from you. The cymbals stood out to me too. I’m not usually a person that loud noises effects, but those would make me want to scream! I cannot imagine how annoying / frustrating they would be for someone who *is* affected by loud noises. PS: Please forgive me if I use effect / affect incorrectly – I always struggle with those! Affect is at a verb. The clock ticks affect at my speaking. Effect is at a noun. The clock’s tick effects are loud. I waited all day to read this. I knew I was not ready. I can’t tell you the times I marvel how my boys survive in this world. I knew reading would make fresh our own walk throughs. The time our boy wasn’t on class list in hall for his inclusion class and no cubby with his name. Telling principal it is a big deal. I am sorry it hurts and I understand. I am sorry for Brooke or our boys ever being told quite hands. I understand and thank you for sharing your night. I am so envious. Not of the “hard.” I know that feeling. I envy the program and the opportunities for support. We live in a tiny, mountain community in the Deep South. We are in an area overwhelmed with poverty and immigration and almost no one cares about making it to high school graduation. Dealing with the accommodations within the school system is like asking for water on Mars. Despite their best efforts, we finally had to concede defeat and move the girls to a tiny private school in our area. Although we lost the protection of an IEP and all special services, the girls simply could not navigate the class sizes and all the inherent issues at the public school. (The school went from small to massive with explosive immigration in this area…600-800 kids per grade.) We knew there would be issues at the new school. We knew that all the change would be tough. We knew that we (meaning ME) would spend an awful lot of time and energy trying to educate teachers to provide supports that they might not understand at all. However, we had three pluses on our side. The new principal of this school had a child on the spectrum, the school was tiny (75 kids total), and they hired a teacher with a dual education and special ed degree, just for us. And, so it began. For the most part, they have been flexible and supportive and understanding. We soldiered through the first year, in one classroom, with one teacher. This year, there are multiple teachers, and some of them…well, they need to move to Mars. Last week, my youngest refused to go to school. She was so upset that she vomited. After some struggle, I was finally able to identify the root of the issue. In reading class, her teacher was repeatedly insisting that she put her feet down. Let’s face it. In the one class that presents NO learning issues for my kiddo, while all the NT kids are struggling massively with a new reading curriculum, the teacher was nit-picking. I knew, deep in my heart, that this teacher was “old school.” She is quite advanced in age, she expects proper posture, and a subdued, obedient classroom. And, heaven forbid, my daughter likes to fold her legs up under her when she is concentrating. I knew that this was the cause of my daughter’s intense stress. So, I approached the teacher. I asked her…nicely…to stop asking my kiddo to put her feet down. Not only does it not cause any distraction in the room, it is comfortable for her, and it helps compensate for her weak core muscles. I even suggested that, if it were so very important for her feet to actually touch the floor, I could bring in a therapy ball for her to sit on which would force her feet to be down and firmly connected to the floor. Well, NO, that would not be helpful at ALL. That is when it happened. I swear, it is by the grace of God that I am not in jail. She said, “I am trying to teach her to be normal. I think it is important for her future. She needs to be normal to be successful.” She is, quite obviously, from the old regime. I knew that, at that moment, I could not teach a pig to sing. I simply said, “I want you to drop it. Your demands are causing significant emotional distress. 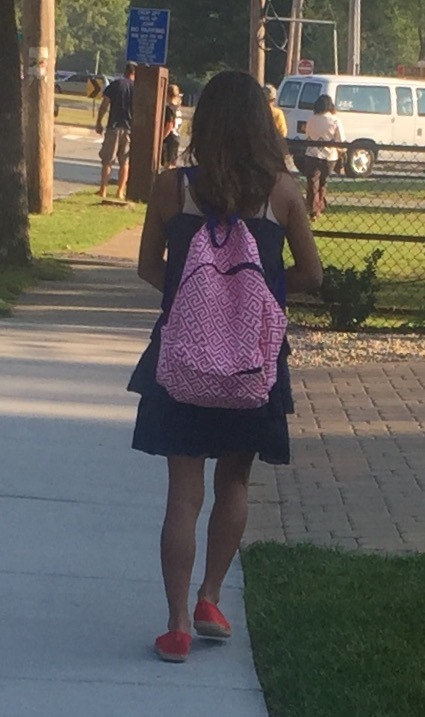 It is interfering with her education.” I wanted to add, “She is here to learn math, science, and language…not how to be normal.” She agreed she would drop it “for now.” I had to leave. I had to get out of that space that causes my daughter pain. I had to get out of there before something popped inside of me. I was more than mad. I was so sad. How can people still cling so fiercely to the concept that “normal” is a real thing? That measuring up against some invisible bar is going to guarantee future success? To miss the point completely that my girl is not defective or unacceptable or “less than” because she likes to sit comfortably while she works. But, more than anything else, the assumption that it is the teacher’s responsibility to decide what non-educational goals my child should reach. She has NO IDEA what my girl fights through every single day just to go to school, to stay at school, to get through her homework, to get to bed that night. No idea. When we have worked through all the REALLY important, significant issues, we’ll talk about unfolding her legs. NOT because it makes the teacher happy. Nope. It would be because her OT is working on her core strength. Her OT does not like her to sit in the “W” for physiological reasons. I get THAT. But, because it makes her “normal.” NEVER.